Sarcopenia or loss of muscle mass not only affects the elderly, it can also deliver a major blow to public health costs. In the U.S. alone, the public health costs of sarcopenia reached $18.5 billion in the year 2000. This cost is also increasing since the elderly population also continues to grow. Many believe that muscle loss is a normal part of aging, but, some health experts argue that it should not be. There’s a saying, “Men do not stop playing because they grow old, but they’ve grown old because they stopped playing.” Put more simply, if you stop living an active life chances are your muscles will also stop growing. So, part of the reason why people lose muscle mass is that physical activity also tends to decrease as age increases. But, many experts argue that muscle loss in aging can be prevented through exercise. Muscle loss is also medically referred to as sarcopenia. This refers to the process of losing muscle mass in the elderly and in people diagnosed with certain chronic diseases. After the age of 30, people start to lose as much as 3-5 percent of muscle mass. And, it will continue to decrease from then on. This means as people age, their bodies also continue to lose muscle mass every decade. Research reveals that sarcopenia speeds up when a person reaches the age of 75. Although in some people sarcopenia accelerates beginning at the age of 65. Others experience it in their 80s. Results from new research conducted revealed that muscle loss starts after changes occur in the person’s nervous system. When a person reaches the age of 75, the number of nerves responsible for leg control will reduce. The reduction of leg controlling nerves could be 30-50 percent. As a result, the muscle fibers will also start to disconnect from the nervous system. This will make the muscle fibers to become functionless resulting in wasting away. For seniors with healthy muscles, the surviving nerves involved in leg control will start producing new branches. These newly developed nerve branches will be tasked to retrieve the detached muscle fibers. This protective mechanism is more likely to occur among seniors who have healthy, large muscles. If this protective system does not work effectively as it should be, those detached muscle fibers will not be retrieved. Thus, a condition called sarcopenia will start to take place. The sad thing about it is that sarcopenia is known to shorten life expectancy. Being sedentary or immobile for some reason increases risk for muscle loss. Not being able to move as much will cause the muscles to weaken. This will also speed up muscle loss. Having an injury and being diagnosed with an illness that make one immobile can also trigger faster muscle loss. Just two to three weeks of immobility can already reduce muscle strength and mass. But, reduced physical activity can trigger a vicious cycle of muscle mass loss and decreased strength. This results in feelings of fatigue which will also make it more difficult for one to become more active again. Add in other physical decline brought about by aging and the senior will surely suffer from muscle loss. Diet that is lacking in protein and calories can lead to reduced muscle mass. Since elderly people often have reduced appetites they tend to lose muscle mass. This reduced caloric intake in an older person leads to pronounced protein and other nutrient deficiencies. Reasons for this loss of appetite may include dental and oral health problems. Difficulty swallowing and reduced ability to prepare one’s own food can also affect a senior’s appetite for food. An illness causes inflammation which sends a message to the body to allow the breaking down and rebuilding of damaged cells to take place. However, if the illness becomes chronic the signals triggered by inflammation will be disrupted. This causes an imbalance of the breaking down and rebuilding process of damaged cells. The result would be muscle loss. Research shows that those who are suffering from COPD also had decreased muscle mass. Other diseases that increase muscle loss are ulcerative colitis, rheumatoid arthritis and tuberculosis. Severe burns, vasculitis and lupus can also result in muscle loss. Muscle loss is also prevalent in people who are suffering from diseases that increase stress. For example, seniors with chronic heart failure and chronic liver disease suffer from sarcopenia. The same is true with people who have chronic kidney disease. Cancer also places severe stress on a senior’s body which leads to sarcopenia. Sarcopenia in the elderly may start to manifest as a decline in walking speed. This occurs as a result of the degeneration of muscles in the legs and buttocks. Difficulty in walking will also become apparent. When the amount of muscle mass decreases, the remaining muscles will have to be the only ones which will bear the workload. Thus, the person becomes more likely to experience fatigue. Grip strength can also be affected making it hard for seniors to do things like opening jar lids. This reduced muscle strength will also lead to decreased mobility. This functional limitation becomes a vicious cycle…less strength leads to less use and less use results in less strength. In turn, the senior becomes less capable of performing some daily tasks. 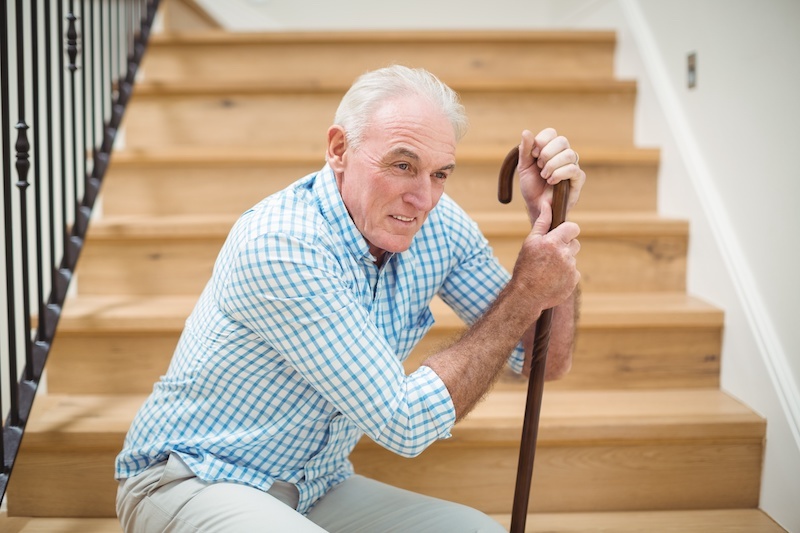 If left unabated, loss of muscle mass will increase a senior’s risk for falls and loss of mobility. It is also one of the major causes of frailty among older adults. As a consequence, the elderly becomes bedridden. Untreated sarcopenia can also increase the risk of death. Exercise is the most powerful way to prevent muscle loss among seniors. This is also true even if muscle loss is not due to aging but a chronic illness. Exercise allows the muscles to improve its strength and aerobic capacity. It is also beneficial in improving protein synthesis and enzyme activity in the muscles. Besides, exercise is also known to decrease a senior’s frailty. Exercise must be done at least three times a week. Experts recommend an exercise regimen that combines endurance and resistance types. This can greatly help reduce the loss of skeletal muscle mass. Add in the improvement of muscle function. Protein plays a crucial role in muscle building and repair. Increased protein intake improves protein anabolism. An improvement in protein anabolism would mean that more amino acids will be converted into proteins. These proteins will then be used by the body for replacement and repair of damaged tissues. The recommended daily protein intake for older adults remains a subject of debate among experts. However, many agree that seniors need more than just 0.8 grams of protein per 2 pounds of body weight each day. This amount may not be enough for seniors who are suffering from a clinical condition. Therefore, the need to increase this amount is a must especially for sickly seniors. However, you should not increase protein intake without first consulting your dietitian or nutritionist. It is also important to choose high quality proteins. Study author Stuart Phillips from McMaster University in Canada suggests that seniors focus more on foods that contain leucine. Leucine serves as an indispensable amino acid for developing proteins. The role of leucine in stimulating muscle growth is so crucial. Without it, muscle growth will not occur and muscle loss will not be prevented. Some great sources of leucine include parmesan cheese, soybeans, beef, chicken and pork. Up your intake of omega 3s. Increasing consumption of omega 3s is one of the low-cost and safest ways to counter sarcopenia. This is because omega 3 fatty acids also play a role in muscle growth and repair. In a recent study, omega 3 supplementation helped slow down muscle mass decline in older adults. This is one of the findings by the experts from Washington University School of Medicine. Experts recommend that omega 3s must be part of the treatment plan for sarcopenia in older adults. Some of the best sources of omega 3s are Atlantic mackerel, salmon, walnuts, chia seeds and hemp seeds. Make sure to get rid first of inflammation-causing foods before you decide to load up on anti-inflammatory foods. Examples of inflammatory foods are fried foods, meat from grain-fed animals and sugar. Foods with trans fat, corn syrup and additives can also induce inflammation in the body. Steer clear from processed and packaged foods because they usually contain high amount of inflammation causing substances. Instead, eat more of green leafy veggies, fatty fish, fruits and nuts. Blueberries and apples are also excellent anti-inflammatory foods. These foods contain lots of polyphenols and antioxidants. These nutrients help reduce inflammation in the body. Keep closer tabs on your alcohol intake. Alcohol is a known risk factor for muscle loss. If you are in your senior years and still drinking frequently, now is the time to wean yourself off from it. Start eliminating your alcohol intake in a gradual manner. This is if you find it hard to stop it cold turkey. If you have been diagnosed with sarcopenia, be serious in ditching your alcohol habit. This is because alcohol inhibits the process of muscle repair. So, if you have sarcopenia, your muscles will have difficulty recovering from it if you continue to drink alcohol. Alcohol not only contributes to inflammation. It can also drain away the critical nutrients from your body thus making muscle recovery more difficult. If you have the habit of smoking, start saying goodbye to it. Smoking has been linked to skeletal muscle dysfunction. Muscle growth is adversely affected by smoking. This is because smoking leads to poor blood flow to your muscles. And, poor blood flow translates to poor oxygen supply. Thus, your muscles will be deprived of oxygen making it less capable of growing and repairing. Be checked for vitamin D deficiency. Vitamin D is important for muscle synthesis. It also helps fight inflammation so that muscle balance and strength are more achievable. However, as a person ages it may become more difficult to get enough Vitamin D from sun exposure. Although you may also get it from dietary sources, there’s no guarantee you’ll get enough of it each day. This is why it is important to turn to vitamin D supplements. Always ask your doctor first before taking any supplements. This is a must especially if you are also taking other medications for your illness. Great food sources of vitamin D include: fatty fish such as salmon and mackerel. Other vitamin D-rich foods are egg yolks, cheese and beef liver. Have your hormonal levels checked. Getting your blood checked every year is important. This way, doctors will be able to determine your levels of growth hormones. Try to find out whether you have enough testosterone and DHEA levels in your blood. And, if found having low levels your doctor can then recommend ways to treat it. Making sure that your hormones are balanced is critical in preventing and treating muscle loss. Both men and women can benefit from added bioidentical testosterone. Menopause can make women more likely to experience muscle loss. Hormone productions are affected during post-menopausal period. This is because menopause leads to lowered levels of estradiol and testosterone hormones. One reason for this is that hormone production in the ovaries is reduced. Talk to your doctor to see if your body would benefit from adding bioidentical hormones.